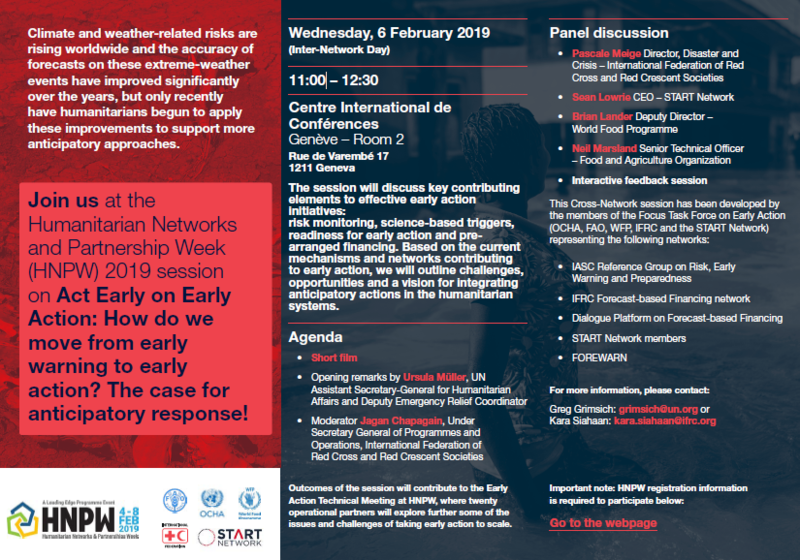 Join us at the Humanitarian Networks and Partnership Week (HNPW) 2019 session on Act Early on Early Action: How do we move from early warning to early action? The case for anticipatory response! Climate and weather-related risks are rising worldwide and the accuracy of forecasts on these extreme-weather events have improved significantly over the years, but only recently have humanitarians begun to apply these improvements to support more anticipatory approaches. This will be the subject of a session at the Geneva HNPW on February 6th, 2019. Kindly note that you need to register to the Humanitarian Networks and Partnership Week to participate in this session.